Mastermind Creations has taken it upon themselves to make sure we get toys of the DJD, The Decepticon Justice Division from IDW's Transformers comics. This brutal team of Decepticon secret police have alt modes that are built for maximum carnage and as such many speculate there is little chance of an official release ever happening. Luckily MMC has us all covered. Cynicus is a third party homage to the DJD's language challenged sniper, Vos. Cynicus turns into a giant sniper rifle. When I say giant I mean he is sized to fit with Combiner figures or incredible large leader style figures. He has a number of flip out handles to allow various styles of figures to hold him, with 3 mm handles, 5 mm handles, and a customized handle for MMC's Feral Rex to hold him. The rifle mode is covered in tech detail and looks great with some awesome pink detailing. Bot mode is definitely where Cynicus shines. He has unprecedented posability including extreme ankle tilts, and even a ball joint ab crunch! There isn't a pose I couldn't get him in and with his large flat feet stability is hardly an issue. Cynicus' rifle can be stored on his backpack as well as the Feral Rex handle adapter. While he does end up with a fairly cluttered backpack it is mostly accurate to his comic portrayal and he has no issues with being back heavy at all. He's got double elbows, ball hinge wrists, a double ball jointed shoulder with movement thanks to the transformation, a double ball jointed head and neck and universal hips. Cynicus can hold his rifle in either hand and has the posability to hold on to the extra support handle on the side of the rifle in many poses. Cynicus' sniper rifle can detach to form a smaller pistol and the remaining rifle bit can plug in to his backpack. The handle is set up to accommodate both 3 mm hands like Cynicus and the MMC Fembots, and 5 mm hands as are the typical standard in most third party and licensed Transformers figures. While this is helpful, it also causes him to hold the pistol or rifle at the very base of the handle and as such the gun doesn't entirely look natural in his hands. Cynicus also comes with a replacement head and face, to emulate his ability to remove his face and install it on to other bots as a sort of torture device. Both parts are molded nicely but the lack of paint apps on the removed faceplate make this a bit of an underwhelming inclusion as you will need to paint it to make it look good. In the package he has a trading card and a combination comic book and instructions. I really dig this figure. I'm a big fan of his design and I'm definitely happy with how he turned out. He is a bit expensive for his size which apparently was due to some factory errors when MMC was producing him. He was meant to be a cheaper released like the fembots but unfortunately it was an unavoidable price increase. I will say he is a bit finicky due to all his small parts and while he is incredibly posable sometimes its hard to make his poses look natural as too much of him can move around. He also has a couple small tabs that are a bit scary when transforming him, like the tabs that hold his backpack in robot mode. 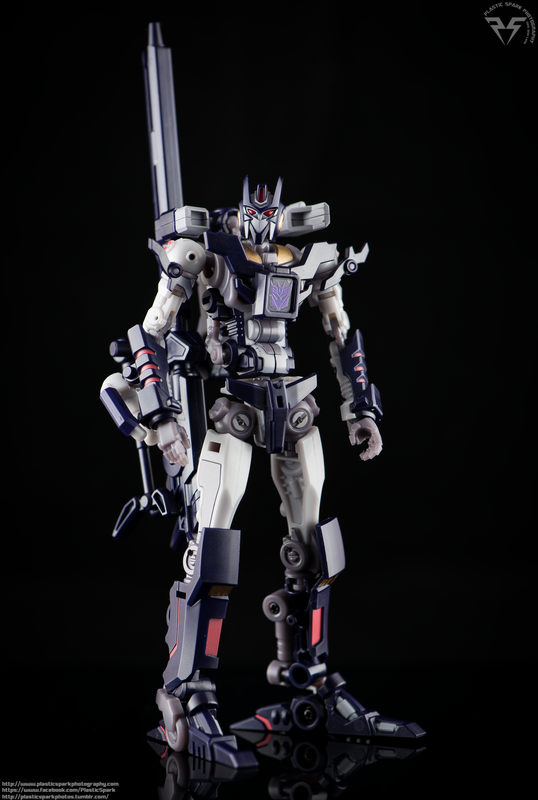 All in all though I am incredibly pleased with Cynicus and looking forward to MMC's next release, Anarchus.